Christmas prezzie perhaps??? Been in storage for 5 years and started second pull! 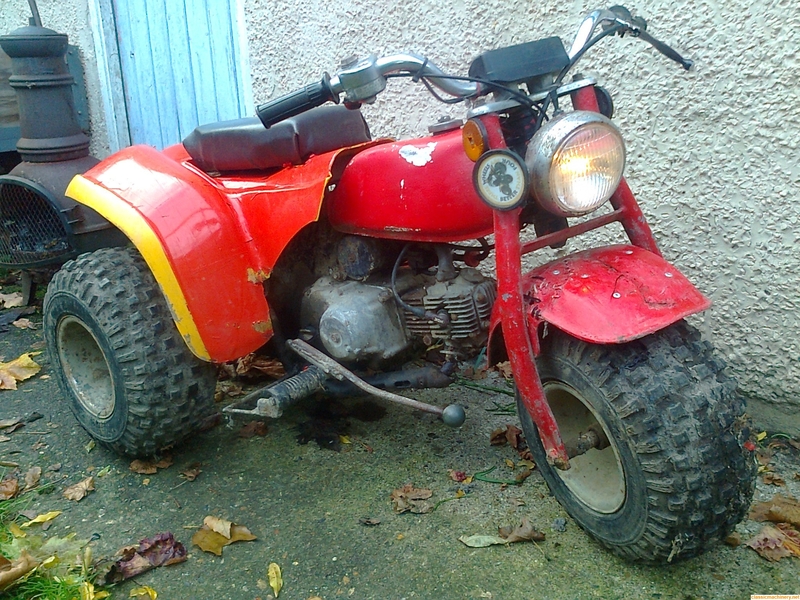 A very collectable Honda ATC 70, from around the mid 1980's. 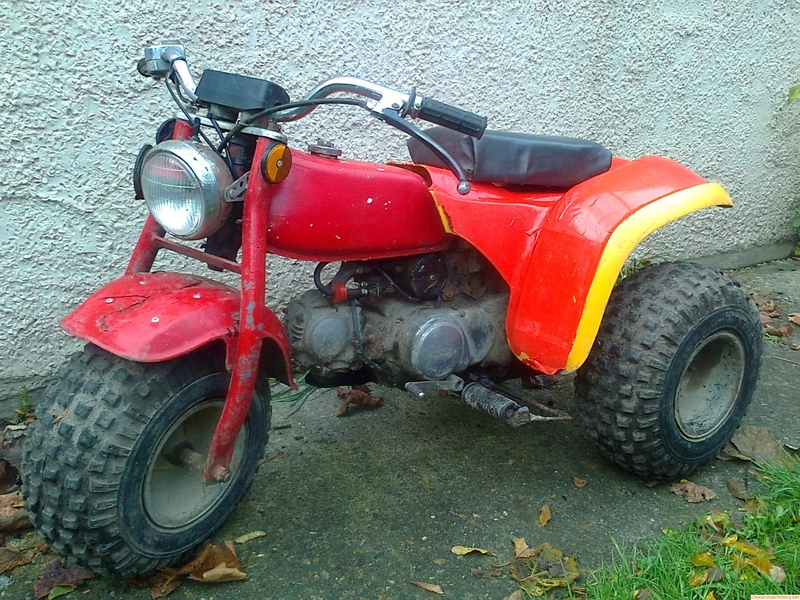 70cc petrol 4 stroke engine, 3 speed semi automatic chain drive off road trike. It is not road registered so there is no V5c. The engine is from a 1984 Honda C70 so it is 3 speed not 4. The kickstart has been modified to a hand start lever. It starts and runs fine, the exhaust headpipe is rusty and blowing. All the gears work, brakes need adjusting/looking at. It has 3 good tyres. It has the original thumb throttle/killswitch unit, and an extra 'bail out' lanyard safety switch has been added. The seat is homemade and servicable. The rear plastic is not original Honda, but fits reasonably well, although it is yellow and been coloured red (badly!) with vinyl. A towing eye has been added to the rear of the frame. Useful for extracting it from places it shouldn't have been. It has working front and rear lights from the C70. Front mudguard has been damaged and repaired with an aluminium plate rivited inside and some ziptie stitching. It may have a suspect back axle bearing but couldn't be sure. Items included are a workshop manual on CD, one unused complete spare wheel, two extra rims. 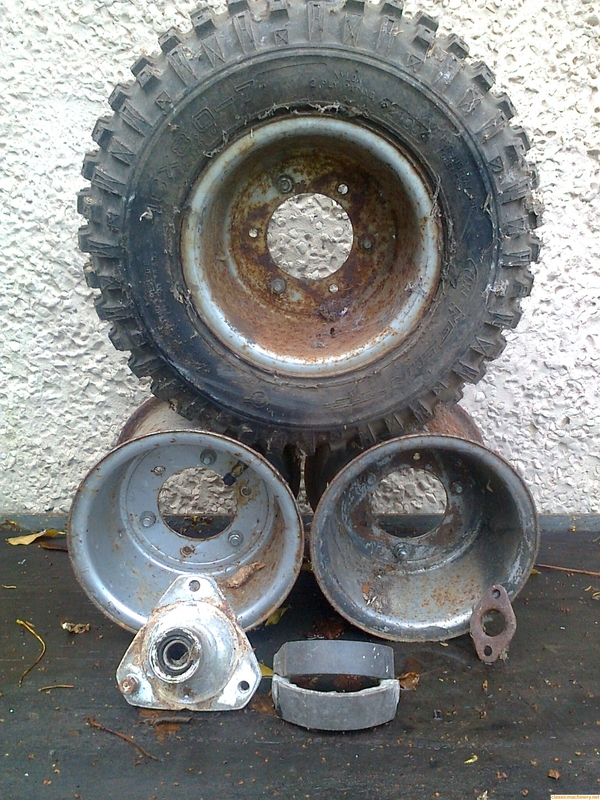 Spare front hub, 2 brake shoes, exhaust flange clamp and the number plate and last tax disc from the donor C70 (registered with the DVLA as scrapped). There is also (not pictured) the original front plastic 'Honda' panel that was removed to fit the headlight. For storage and transport purposes it is 50" long, 30" wide, and 30" high. Looking for offers around £500, located near Aldershot, Hampshire.